ACID Pro 8 is covered by the Novedge Best Price Guarantee. Introducing the all-new ACID Pro 8. This is the latest version of the software that launched loop-based music production 20 years ago and is packed full of contemporary and pro-level features for today's creative artist and producer. Powerful 64-bit technology sits behind a sleek, new interface which maintains ACID Pro's famed ease of use. Dozens of new instruments and effects line up with 12 GB of all-new content to give you everything you need for your music making, in whatever genre you produce. With VST3 support coming soon in a free update, ACID Pro is future proof and ready to embrace a new world of plug-ins. ACID Pro 8 is the legendary software, reborn for 21st-century production. ACID Pro 8 boasts a brand new interface reflecting its status as a modern, sleek and creative DAW that appeals to all levels of music producers. Existing ACID users will feel right at home with its familiar workflow, but enjoy a slick, new environment designed for more precise mixing, creative composing and professional recording. CID Pro 8 is a powerful 64-bit DAW that features ACID's famous innovative audio looping technology, powerful multitrack recording and hi-end audio and MIDI features - all set within an easy-to-use interface to help artists of all levels bring their musical aspirations into reality. Version 8 introduces a brand new GUI but the same famous workflow, creating an immensely powerful and creative music production environment: 64-bit processing, no less than 16 new instruments, 13 new effect plug-ins and 9 GB of new ACIDized loops. Plus, VST3 support is coming soon in a free update giving you access to thousands of third party plug-ins. ake advantage of all the power of your 64-bit operating system. Create complex projects with tons of loops, demanding plug-ins and lots of tracks and real-time effects – more power for your music. nspired to inspire! The completely refreshed user interface is designed for the special needs of musicians. Precise mixing, creative composing or professional recording – all at lightning speed. ACID Pro 8 is the DAW that marries professional features with a legendary and inspiring loop-based environment to help turn all of your creative visions into reality. With its slick new interface and powerful 64-bit architecture, you'll be composing, mixing and remixing faster than ever before. It's time to experience a DAW with unparalleled MIDI sequencing and loop-based music creation features: ACID Pro 8! It's a DAW with more instruments and effects than ever before, the same easy workflow that ACID is famous for, superb remixing features and free VST3 support (coming soon). 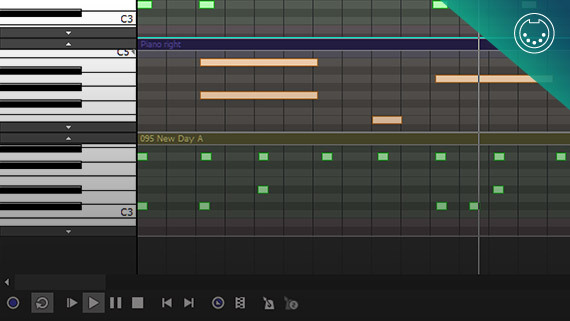 It's the DAW for creating your musical dreams.